"In reality, architecture has become too important to be left to architects. " 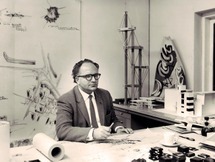 Giancarlo De Carlo (December 12, 1919 - June 4, 2005) was an Italian architect. He was born in Genoa, Liguria in 1919. He trained as an architect from 1942 to 1949, a time of political turmoil which generated his philosophy toward life and architecture. Libertarian socialism was the underlying force for all of his planning and design. De Carlo saw architecture as a consensus-based activity. His designs are generated as an expression of the forces that operate in a given context including human, physical, cultural, and, historical forces. His ideas linked CIAM ideas with late twentieth-century reality. After working a while with Franco Albini at the beginning of the 1950s, De Carlo began his own career. This is a period of his long friendship with Carlo Bo, the rector of the university of Urbino, who got De Carlo involved in the restructuring of the university complex and the city of Urbino. 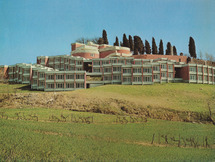 From 1958 De Carlo started working on the master plan for the little Italian hill town. This study resulted in various commissions over the years, in and outside of the city center, such as the student dormitories of the Collegio del Colle (1962-66), and the university building Il Magistero (1968-76). From the mid-1970s onward De Carlo’s office remained very productive, with the Mazzorbo housing estate in Venice (1979-85) as one of the best-known projects. De Carlo was introduced to the circles of CIAM by Ernesto Nathan Rogers, who also invited De Carlo to join the editorial staff of Casabella Continuità, to which De Carlo contributed until 1956 when he resigned because of disagreements over the periodical’s policy. In 1959, at the CIAM conference in Otterlo, he presented his 1954 Matera project. Despite the severe critique, he would join the ranks of Team 10 shortly hereafter. From the Royaumont meeting in 1962 onward his contribution to the Team 10 discourse would gradually gain profound influence. He organized two meetings, in Urbino (1966) and in Spoleto (1976). In 1968, when he was co-organizing the 14th edition of the Milan Triennale, he also invited some of his Team 10 fellows to present their ideas on the issue of ‘Il Grande Numero’. In the mid-1970s De Carlo started two new platforms for architectural discourse, the bi-lingual journal Spazio e Società (1978-2000), and the International Laboratory of Architecture and Urban Design (ILAUD, 1974-2004). The issues dealt with by ILAUD were also those elaborated by De Carlo within Team 10, particularly the reading of context, history, and territory as well as social issues such as participation and reuse of historic sites and buildings. The same issues were taken up by Spazio e Società, edited by De Carlo and his wife Gulliana Baracco. Next, to his teachings at ILAUD, De Carlo also taught at the Venice school of architecture and was a guest lecturer at many international schools, most notably in the USA, among others at Yale University, MIT, UCLA and Cornell University. His writings include early books on Le Corbusier (1945) and William Morris (1947); publications of his work and ideas include: La piramide rovesciata (1968), An Architecture of Participation (1972), Gli spiriti dell’architettura (1992) and Giancarlo De Carlo: Immagini e frammenti (1995). On 12 December 1989 he was named on an honorary citizen of Urbino and in 1994, thirty years after the first one, he drew up its new master plan. 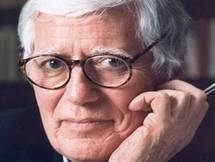 In 1993 he received the RIBA Royal Gold Medal, followed by numerous other Italian and international honorary doctorates.